The Mighty Doonans are back for their fifth appearance in five years, albeit six months later than normal. A great night is guaranteed. The nine piece family band have a deserved reputation for their imaginative interpretations of traditional and contemporary songs. With electric guitars, violin, keyboards, drums, saxophone, pipes and amazing vocals, The Mighty Doonans have the ability to blend different genres of music, dance and the occasional joke in their act. This leads to thoroughly entertaining performances that delight audiences across the folk world. The Mighty Doonans were formed from The Doonan Family Band that included, the then ‘youngsters’ Mick Doonan, Kevin Doonan, Phil Murray and Stu Luckley. On forming The Mighty Doonans the four were joined by Ian ‘Walter’ Fairburn, along with the next generation family members, Frances Doonan, Rosie Doonan, Ben Murray and Jamie Luckley. Mick plays pipes, flute, saxophone, as well as crooning the bluesy numbers with his soulful vocals. Kevin is a highly respected fiddler. He learned his craft playing with his father, the great John Doonan and all of the musicians who used to visit the family home. Phil plays innovative acoustic and electric bass. He also plays with The Tom McConville Band and has been known to introduce a modicum of humour into the concerts. As well as vocals, Stu plays acoustic and electric guitars. He arranges much of the band’s repertoire. Walter is a remarkable instrumentalist playing lead guitar and mandolin. Mick’s daughter, Rosie plays saxophone and piano and sings like an angel. Jamie’s upbringing in the folk world and his eclectic music taste has brought new rhythms and inspiration to the band. Ben is and outstanding accordionist, pianist and singer. Among his many achievements include playing The Song Man in ‘Warhorse’. In 2018, he performed the role in the world tour of the musical. And last, but not least Mick’s eldest daughter plays flute, saxophone and dances like the champion she is. 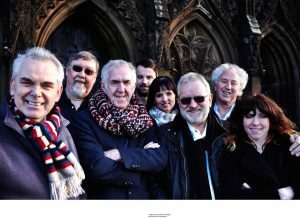 So, The Mighty Doonans continue to deliver their traditions and influences with powerhouse arrangements, such as Sam Cooke’s ‘Bring it on Home’ and sensitive interpretation of songs like Eddie Pickford’s ‘Johnny Miner’ whilst retaining their renowned rapport and relationship with their audience. Advanced Tickets for this concert are priced at £14.50 and can be obtained from One Stop (Kirton), from Brian on 01652 649230 or from www.wegottickets.com. Error: Error validating access token: Session has expired on Saturday, 23-Mar-19 02:32:21 PDT. The current time is Thursday, 25-Apr-19 23:43:56 PDT.